The Directorate of Medical Education and Training, Bhubaneswar, Odisha is organized an Odisha NEET Counselling in the month of June 2018. The admission in the Odisha NEET college in courses like MBBS & BDS will be offered to through the NEET Score Card. Candidates who qualified for the exam are only considered for the Orissa NEET UG Counselling. In this article, we are providing the other details like counseling scheduled, cut-off and seat allotment. Applicants can read this article if they have any doubts regarding the Odisha NEET counseling. Applicants who are going to attend the OJEE NEET Counselling is required to be present on the day of the counseling. The registration of the counseling is start in the month of August in the online mode. The other detail regarding the Odisha NEET Counselling 2018 Scheduled is given below the table. When the Odisha NEET Counselling is organized some of the applicants don’t know the procedure of the counseling. So for the simplification of the candidate, we are providing here the steps for the Odisha NEET Counselling Procedure. The applicant can read this step to know the counseling procedure. Before going for the counseling, applicants require to register on the official site of the Odisha NEET and fill the application form. After filling the application form applicants are required to fill the choices of the colleges provided to them in the choice filling and choice locking option. After the filling of the choices, the applicant requires to verify their documents. Candidates will get the admission letter from the counseling members with the acceptance of the documents. The allotment of seats will be done according to the candidates rank and the choices filled by them. After the whole counseling process is done OJEE will send the list of the candidates along with the admission fees to their recognized institution. At last, after the whole process is done applicants are required to report at the allotted college for the final admission at the time allotted to them. When the Odisha NEET counseling is organized applicant are required to bring the original document along with the photocopies for the verification purpose. So we are providing here the list of Odisha NEET Counselling Documents Required. The cut off marks are the minimum marks which are required for participating in the counseling of any of the exam. Applicants who are appearing for the counseling is required to clear the Odisha UG MBBS Cutoff. The cut off marks are provided in the table. In the Odisha NEET Counselling, the reservation of seats is done according to the category of the candidate. The list of Odisha NEET Counselling 2018 Seat Reservation is given below the table. 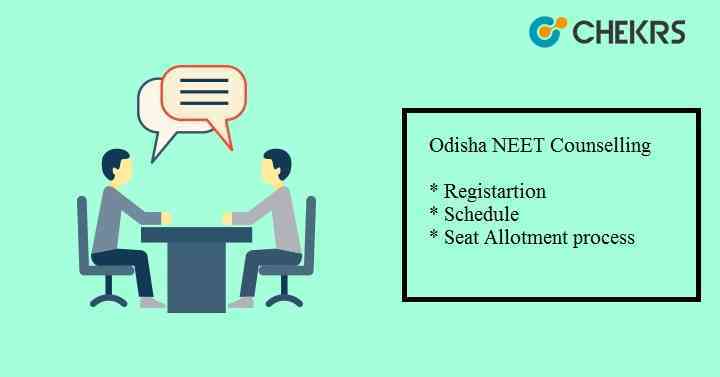 When the Odisha NEET Counselling is organized the applicants are required to fill the choices of the seat allotted to them. The applicants will get the seats in various MBBS colleges in Orissa through the OJEE MBBS Seat Allotment 2018. So it is necessary for the candidates to fill the choices of the colleges carefully in the counseling process. The information provided here is as per the official notification. Those applicants who don’t know the counseling procedure of the Odisha NEET 2018 can follow the above steps. If they have any further queries they can contact us through the comment box.